Members of 5th Special Forces Group conduct .50-cal weapons training during counter-ISIS operations at Al Tanf Garrison in southern Syria. Jerusalem - On January 10, United States Secretary of State Mike Pompeo delivered a speech repudiating the Obama administration’s Middle Eastern foreign policy. Delivered in the same city as Obama’s infamous Cairo speech 10 years ago, Pompeo sought to reassure allies that America had learned from Obama-era mistakes, that the United States is reliable, that it will stand with its allies. America was there to stay. He said, “Remember: It was here, here in this city, that another American stood before you. He told you that radical Islamist terrorism does not stem from an ideology. He told you that 9/11 led my country to abandon its ideals, particularly in the Middle East. He told you that the United States and the Muslim world needed, quote, ‘a new beginning,’ end of quote. The results of these misjudgments have been dire” (emphasis added). A speech announcing, in effect, “America is back” should have reassured U.S. allies, with leaders in Egypt, Saudi Arabia, Jordan, Bahrain and Israel nodding their heads in agreement. But the speech fell flat. Why? Because a dramatic shift has taken place in the Middle East—a shift specifically prophesied in the Bible. However, the presence of American soldiers on the ground has an outsized impact, no matter the number. Reassuring words for America’s Middle Eastern allies—except that just eight days later,President Donald Trump decided to pull all 2,200 American troops out. By all accounts, he made this decision alone and against the advice of his military and political advisers. The next day, it emerged that Secretary of State James Mattis was resigning over the issue. Some believe criticisms of Mr. Trump’s decision to withdraw American forces are overblown; after all, the U.S. had only 2,200 soldiers in Syria. However, the presence of American soldiers on the ground has an outsized impact, no matter the number. This is undoubtedly true in the complicated Syrian war, especially for the Kurds in north Iraq, which is why many are viewing the withdrawal as a betrayal of the Kurds. 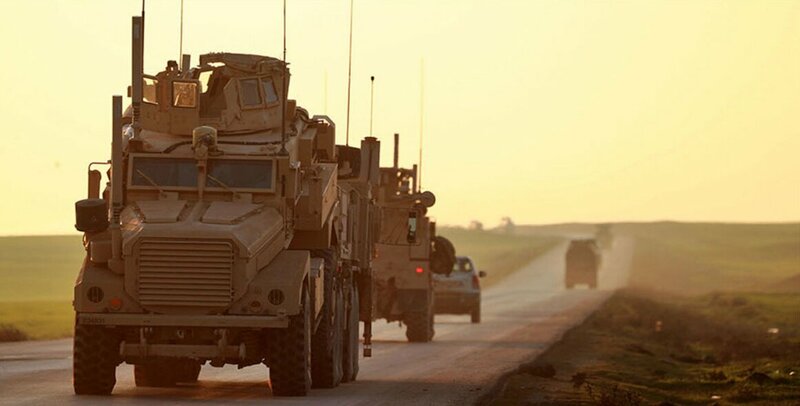 U.S. Marines drive along a road in Syria. Heightening this perception is the fact that President Trump made his decision after a phone call to Turkish President Recep Tayyip Erdoğan, in which Erdoğan said Turkey could take care of the remnants of the Islamic State. American forces in Syria have sought to train and equip Kurdish forces in the fight against the Islamic State. The Kurds have proved to be one of the most effective forces in the fight. However, America’s support has long upset Turkey, which believes a stronger Kurdish presence in Syria could destabilize the Kurdish population inside Turkey. Turkey’s mission in Syria has been to prevent the Kurds from growing too powerful. U.S. forces embedded with the Kurds have deterred Turkey, Iran and Russia from attacking them. Bloomberg View’s Eli Lake wrote that President Trump’s decision could be seen as giving in to Turkey and abandoning a U.S. ally: “Capitulating now to Turkish demands would send a terrible message. Erdoğan would conclude that threatening U.S. interests pays off. Meanwhile, other groups that have joined the American side in the Middle East would conclude the U.S. is an unreliable ally” (Dec. 20, 2018). As commander in chief, the president has the right to overrule his advisers and withdraw U.S. forces. However, its jarring break from his administration’s public assurances that the U.S. would stay in Syria renders any future statements from his subordinates as hollow. That includes these most recent statements by Secretary Pompeo. His words were accurate, but they packed no punch. They didn’t come from the real decision maker in Washington. And even then, had it been President Trump himself in Cairo, the fact that American policy in the region can turn on the swiftness of a tweet has eroded the trust of America’s allies. Encapsulating this reality is the fact that while Pompeo states the United States will oppose Iran, U.S. troops are getting ready to board cargo planes outbound from Syria. In addition to training the Kurds, the U.S. currently occupies a base in a crucially strategic location on the Syria-Iraq border. The Al-Tanf base launches missions against the Islamic State. More importantly, it constitutes a roadblock on the Baghdad-Damascus Highway. Without it, Iran would gain control of the highway for hauling illicit arms to the Syrian regime and Hezbollah through Iraq. Iran desires to control the vast swath of land from Iran, across Iraq, Syria and into Lebanon. Dominating this “Shia Crescent” is one major reason for Iran’s engagement in Syria’s civil war. Until the withdrawal announcement, disrupting Iran’s command of this Shia Crescent seemed to be one of America’s main objectives in Syria. The Al-Tanf base’s stated purpose was for staging strikes against the Islamic State, but it also served as a valuable buffer between Iranian forces in Syria and Iraq. By withdrawing forces from Al-Tanf, the U.S. will no longer be positioned to stop Iran from controlling the roadway from Iran to Lebanon. As Tony Badran wrote, “Already, Iranian-led Shiite militias are operating at the edges of the U.S. zone and could move in swiftly and connect the Iraqi and Syrian terrains. This would provide Iran with overland routes to deliver advanced weapons to Hezbollah in Lebanon, while building up offensive capabilities in Syria, including in the south, along the country’s border with Israel” (usa Today,December 19). Words are nice, but nothing can replace the physical presence of troops wearing American flags on their shoulders. In his Cairo speech, Secretary Pompeo assured America’s allies that the U.S. still seeks to eradicate Iran from Syria. “In Syria, the United States will use diplomacy and work with our partners to expel every last Iranian boot,” he said, “and work through the UN-led process to bring peace and stability to the long-suffering Syrian people.” Yet how will the U.S. accomplish this after withdrawing its troops? Words are nice, but nothing can replace the physical presence of troops wearing American flags on their shoulders. And America’s allies in the region know it. So do its enemies. No one doubts that President Trump wants to counteract Iran’s march across the Middle East and block off the western part of the Shia Crescent. His withdrawal from the nuclear agreement with Iran and the renewal of the financial sanctions are strong proof. He understands that financial inducements alone will not stop Iran. However, President Trump does not understand why it must be United States forces manning the battle stations. He wants to bring U.S. forces back from Middle Eastern battlefields and force allies to pay their fair share in mutual defense. The idea of sharing the burden in countering Iran is reasonable. However, given that the president’s stated desire is to withdraw forces from the region, America’s allies now know that U.S. support is unlikely to include U.S. troops. 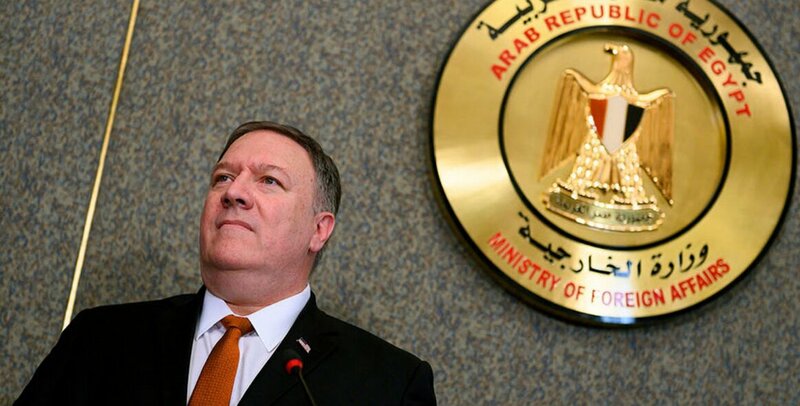 U.S. Secretary of State Mike Pompeo speaks in Cairo on January 10. According to Bahrain’s minister of foreign affairs, an Arab nato would include Saudi Arabia, Kuwait, Bahrain, the United Arab Emirates, Oman, Qatar, Egypt and Jordan. No doubt Israel would be loosely affiliated, given it is the one strong power that has been willing to directly attack Iranian targets in Syria. However, America’s absence would make the coalition less effective tactically and more vulnerable to attack strategically. An American ground presence in a battle zone, no matter the size of the contingent, has a stabilizing effect. It acts as a deterrent against potential attackers: Enemies who want to attack U.S. allies and troops know that doing so invites the wrath and retaliation of the world’s most powerful military. If U.S. troops cannot be guaranteed, it is unlikely this multinational force will hold together in the face of Iranian aggression. That is—unless another power can replace the United States as the bedrock to such an alliance. The Bible indicates this is precisely what will happen. And it tells us who that new power will be. President Trump’s withdrawal from Syria has damaged America’s credibility in the region. In the tumultuous Middle East, reliability and predictability are essential attributes in an ally. Arab nations and Israel will gladly accept all the weapons and financial support America is willing to give. But given that the region is a powder keg, they simply cannot risk depending on the U.S. to come to their defense in the face of Iranian aggression, regardless of speeches by a U.S. secretary of state. The search for new allies is underway. While some may rejoice over America’s withdrawal from the Middle East, the Bible reveals that its absence portends the most destructive period this war-weary region has ever seen. It is worth considering where these events are leading, especially as they will affect you and your family, whether you live in the region or not. Every important biblical prophecy that takes place in the Middle East occurs in a power vacuum created by America’s exit. In fact, Bible prophecy indicates that the U.S. will have vacated so entirely from the Middle East that it will not impact it at all. Here, in prophetic terminology, is described a war in the Middle East involving two powers leading two alliances. For more than 20 years, Watch Jerusalem has identified the “king of the south” as radical Islam, led by Iran. This power bloc has a violent, pushy foreign policy that will eventually provoke a violent response. Every night of news, including Pompeo’s speech, clearly shows that Iran is this king. But notice that this prophecy does not state that the king of the south pushes against the United States. (The U.S. is one of the modern nations descended from the ancient Israelites; Bible prophecy identifies it as Israel, specifically the tribe of Manasseh.) The U.S. won’t even be part of the equation. The power bloc that this Iranian-led alliance pushes at is “the king of the north.” For more than 70 years, we have identified this power as a European empire led by Germany. Europe will respond forcefully and powerfully to put down Iran’s aggression. Based on another prophecy found in Psalm 83, we anticipate Europe’s entrance into the Middle Eastern arena—a move that may be precipitated by the scramble for allies by Middle Eastern states following the U.S. withdrawal now underway. Secretary Pompeo is trying to create an Arab alliance to counter Iran. The Bible indicates that such an alliance will form, but the United States will not be part of it. The Psalm 83 prophecy states that several moderate Middle Eastern states, including some in the proposed Arab nato, will ally not with the U.S. but with the “king of the north,” which is Europe. The prophecies of Psalm 83 and Daniel 11:40 are for the end time, which is the time we are living in right now. They are crucial events on the prophetic time line that ends in one final Middle East battle at the coming of the Messiah. An American withdrawal from the Middle East is necessary for these prophecies to take place.